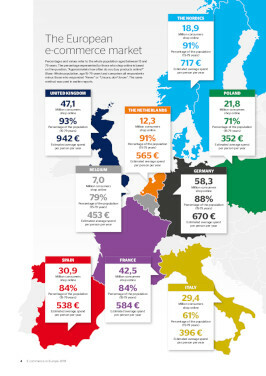 European e-commerce continues to show strong growth. Nearly 270 million Europeans, in the countries covered by this study, say that they regularly shop online. In parallel with consumers’ growing online shopping habits, another trend is emerging and becoming clearer every year: more and more people are buying products from outside the borders of their own country. E-sellers that have a strategy for meeting the expanding demand for cross-border e-commerce will be tomorrow’s winners in the European market. The report “E-commerce in Europe”, commissioned by PostNord for the fifth consecutive year, charts the behavior and preferences of e-commerce consumers in twelve European countries. The report is based on interviews with 10 000 consumers in the age group 15-79 years, and the ambition is to present important insights on differences and similarities between various markets. During the last year, 268 million European consumers made online purchases worth around EUR 198 billion. This represents an increase of EUR 17 billion compared to the preceding year. 200 million consumers, almost 75 %, also made purchases from foreign markets. This number emphasizes the need for e-sellers to adapt their businesses to relevant local conditions, for example regarding how consumers want products delivered and how they prefer to pay for them. Another noticeable development is that shopping via mobile devices is showing steady growth. Previously, mobile maturity has varied sharply across Europe but is now increasingly becoming more even. For Europe as a whole, six out of ten consumers have used their mobile phone or tablet for shopping in the past year.